A whole year? Oh... DEER! Everlee is turning a year young and I just can't wrap my mind around that! I love my job so very much but having to see these babies grow up in the blink of an eye makes me question if we are getting all the hours in our days or if the world is shorting us on time. A year ago (Mar 15) I posted about Everlee's hospital, 'Hello Baby' session, where I went and visited her sweet family within the first day of her life, capturing timeless moments, including the one where her adorable older brother, Eli met her for the first time. She graced the world with her beauty and stole her mom & daddy's hearts from the second she took her first breath. And now, here we are! 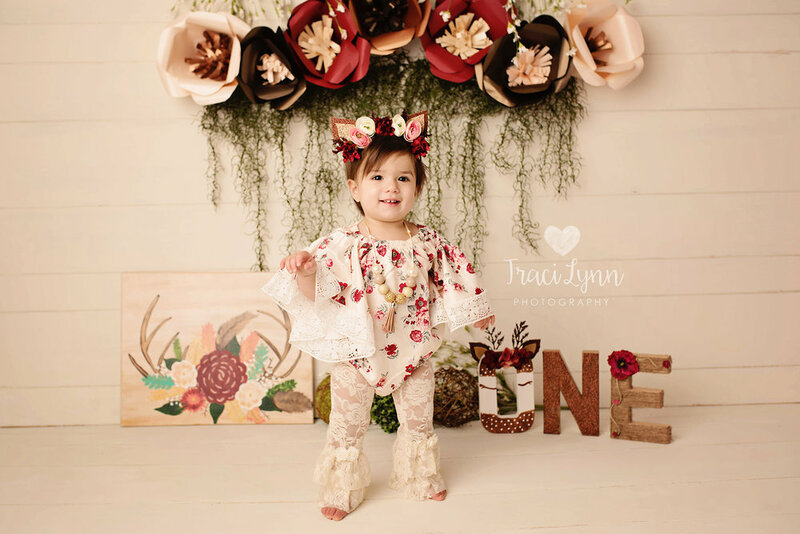 Everlee has the sweetest little expressions and mannerisms, her mommy dresses her in the CUTEST outfits, and styled one of my favorite setups for a birthday EVER. Seriously, I can't get over it, she did such a great job! From pops of deep red, natural greens, creams and white, also the little hint of gold glitters, everything was absolutely perfect. We started the session in my Mabank Texas studio with a white paneling backdrop with matching floor, spanish moss greenery, and handmade paper flowers hanging. Everlee had the sweetest headpiece and check out that perfect outfit! I mean, isn't that just the sweetest!? I have to, HAVE TO, get that printed for the TLP studio walls! She was so dainty and cute eating some of the cake. Babies usually never really EAT the cake, they just kind of pick at it, lick some icing, and then make a huge mess. Everlee poked the icing, ate tiny bits of the icing, and then pushed it off the stand with her foot. All in all, the session was hands down one of the cutest things I've ever seen, just like little Miss Everlee! Happy (early) first birthday, sweet little girl! Thank you so much to Daniel & Kristen for bringing her in over the last year to capture her growing from that sweet little chubby cheeked newborn to this petite & sweet (almost) ONE year old! If you'd like to schedule a first birthday session, with or without cake, contact Traci Lynn Photography within 2-3 weeks of your planned party date. 2-3 weeks is best so you can print beautiful portraits from your session to display at the party and hand out/send to loved ones. They make great Thank you cards as well! Click here for more information on First Birthday sessions with TLP!